History – Due to the eradication of nearly 2,000 acres of hydrilla (an invasive species) in Lake Conroe since 2006, the Seven Coves Bass Club Aquatic Plant Restoration Program has become one of the most important restoration projects in the area to help keep the local bass fishery in a healthy state. In 2007, SCBC received a grant for $68,000 from the National Fish and Wildlife Foundation for native aquatic plant restoration on Lake Conroe (press release). SCBC was awarded an additional $20,000 from Gulf States Toyota, Bass Pro Shops, and Texas Parks & Wildlife presented at the 2010 Toyota Texas Bass Classic. 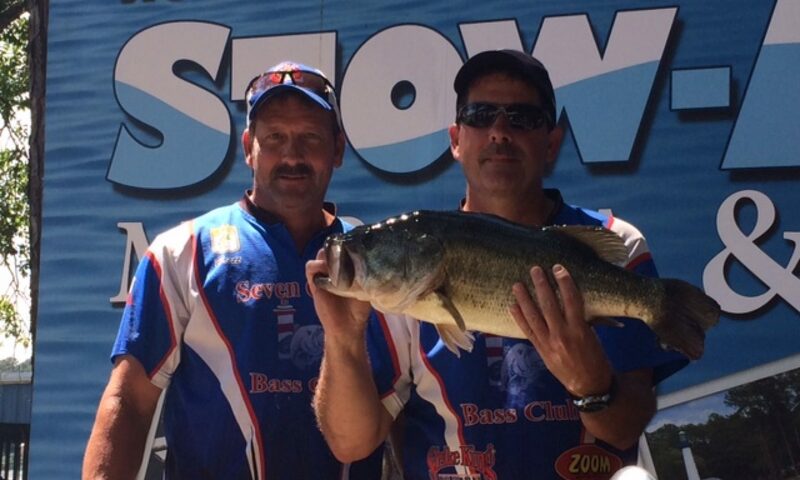 SCBC was also awarded $6,000 by Legend Boats in our partnership in the Lake Conroe Big Bass Extravaganza. We are also the first chapter member of Friends of Reservoirs. With our partners in the “Lake Conroe Habitat Improvement Project Coalition”, Texas Parks & Wildlife, San Jacinto River Authority, Texas Black Bass Unlimited, Texas B.A.S.S. Nation, Lewisville Aquatic Ecosystem Research Facility, and the Reservoir Fish Habitat Partnership, we have restored over 5 miles of shoreline with aquatic vegetation and placed over four acres of “spider block” fish attractor reefs. These efforts were recognized by the Texas Commission on Environmental Quality (TCEQ), which named the Lake Conroe Habitat Improvement Project Coalition the 2013 winner of the Texas Environmental Excellence Award in the Civic/Community category. Other awards include the B.A.S.S. Conservation Club of the Year and the Outstanding Fisheries Worker Award from the Texas Chapter of the American Fisheries Society. Our mission is to protect the waters of Lake Conroe and other fisheries from native habitat destruction, natural and man made, and to lead and educate anglers, recreational lake users, and property owners on the importance of aquatic plant habitat and its effects on the ecology, water quality, and habitat in our reservoirs. On May 1st, The Texas Environmental Excellence Award from the Texas Commission on Environmental Quality (TCEQ) was presented to Ron Gunter (SCBC) and Mark Webb (TPWD) during a banquet at the TCEQ convention/expo at the Austin Convention Center. Other partner recipients in attendance were SCBC President Derek Taylor, Dave Terre, Craig Bonds, Rick Ott, Gary Saul, and Carter Smith with TPWD, Brett Raley & Blake Kellum with SJRA, Ed Parten with TBBU, Dr Michael Smart and Lynde Dodd from LAERF and Tim Cook – Conservation Director Texas B.A.S.S. Nation. This prestigious award was the result of the collaboration of many different organizations and the accomplishments of the Lake Conroe Aquatic Habitat Partnership. 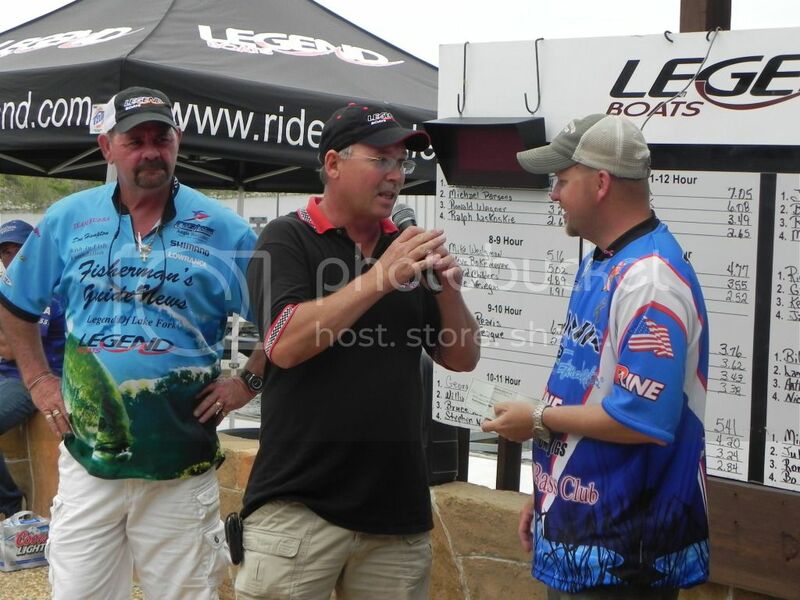 SCBC President Derek Taylor Receives $3,000 From Legend Boats President Randy Qualls at the 2012 Lake Conroe Big Bass Extravaganza. 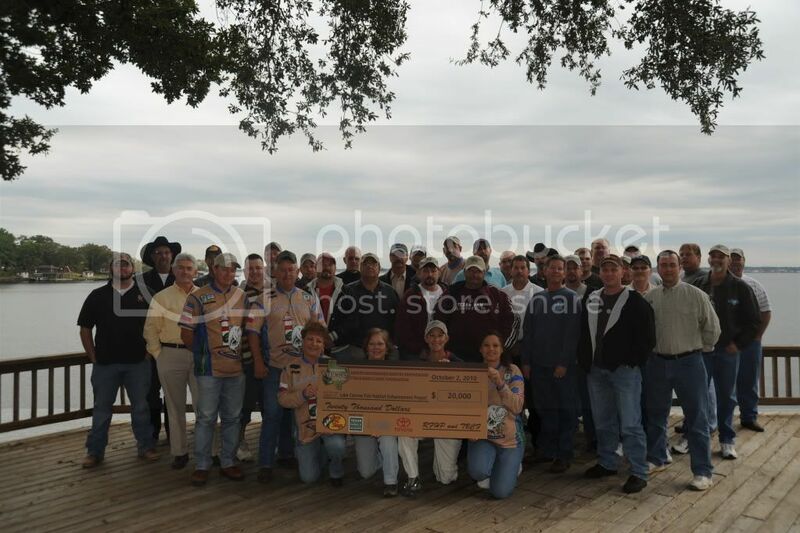 Another $3,000 was donated at the 2013 Lake Conroe Big Bass Extravaganza. These Funds Will Be Used For Native Plant & Conservation Projects On Lake Conroe. In July 2011, SCBC Partnered with Texas Parks & Wildlife to sanction a permitted grass carp tournament on Lake Conroe. Over 300 carp weighing 3,000 pounds were harvested to help protect native vegetation in the lake. B.A.S.S. 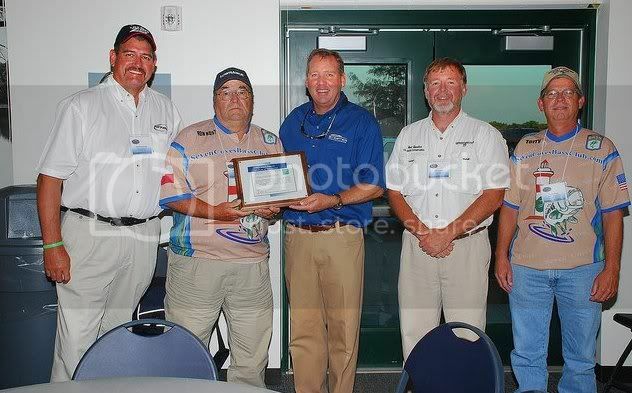 Elite Series Pro Alton Jones congratulates SCBC at the inaugural Texas Parks & Wildlife Angler Biologist meeting in August 2010. Keeping FM 830 clean outside Seven Coves neighborhood.